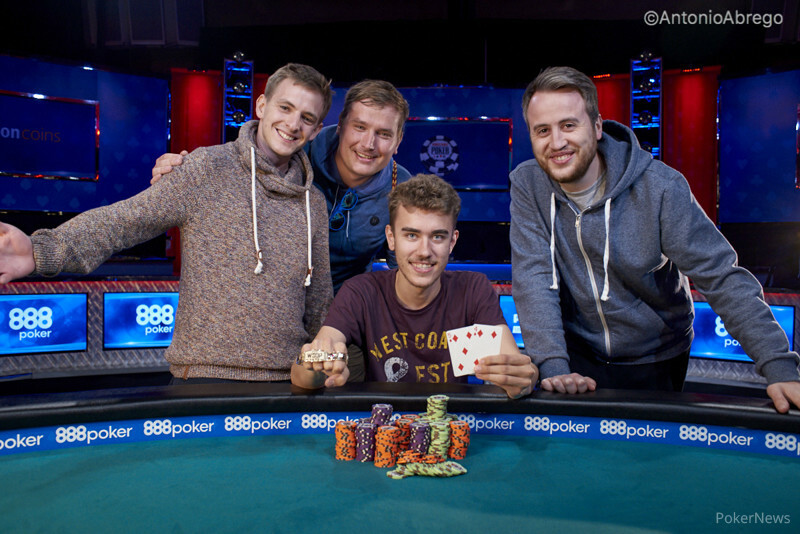 Another young German player joined the ranks of World Series of Poker bracelet winners, as 22-year-old Chris Frank conquered a field of 1,698 to win Event #33: $1,500 No-Limit Hold'em for $384,833. Frank had already had quite a bit of success playing live tournaments, racking up north of $1 million in cashes before this win, but he was thrilled all the same, shouting with excitement as the last card peeled off the deck in his heads-up match with Ryan Leng. "I don't think it really has sunk in yet," Frank said. "It's a very good feeling. I've been playing the live circuit for pretty long, and I've always dreamed of winning something big. Now, I've done it, so that's pretty cool." Frank came in with one of the bigger stacks at the start of the day, but Leng was the one who dominated for most of Day 3. He had nearly double the chips of second-place Pratyush Buddiga when the unofficial final table got rolling. There was plenty of notable competition, as in addition to Buddiga, Georgios Sotiropoulos, Noah Vaillancourt, Max Pescatori and Michael Gagliano all made the final table. Leng continued to crush, scoring the first four eliminations at the official final table — including the latter four notables listed above — and amassing nearly half of the chips in play. 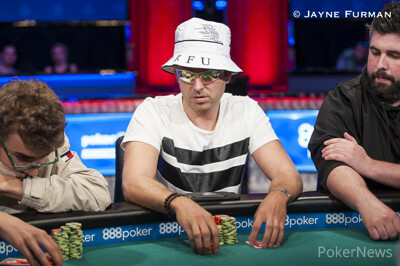 "Ryan had good hands and played well and was busting people," Frank said of the early portions of the final table. "We were short-handed pretty quickly. Then, I just ran super good." Indeed, Frank went on a heater at that point. His trademark move became the snappiest of snap-calls, wherein he'd be facing an all-in bet and splash in chips while turning over his cards in the blink of an eye. First, it was ace-king against the threes of Grant Denison, hitting an ace on the river. Then, he three-bet aces against Buddiga, who four-bet shoved fours and went bust when neither he nor Frank improved. He made flush over flush and aces up over aces up against Leng to take a good chunk of his chips, as well. Arkadiy Tsinis was the next victim of the snap-call, as he jammed jack-eight of diamonds and ran into Frank's ace-king of diamonds. Frank had about a 3:1 lead heads-up against Leng, and it didn't take him long to finish the job, as it was over in about 20 hands, including a huge bluff catch by Frank with second pair. "I think I played well, but I just had very good situations and spots, and it was pretty easy," Frank said. The snap-calls, Frank said, are just a normal part of his game, and he characterized himself as an overall fast player. "I had so many good hands!" he said. "I wanted to put my chips in." While Leng had a decent-sized rail cheering him on, Frank noted about halfway through the final table that he had naught but ghosts on his side. When some of the railbirds needled him gently about it, he fired back. "I guess the reason the Germans have all the money is because they are grinding and not watching," he said. "I guess these days, the Germans have won so much that an event like this isn't that exciting anymore," Frank said after he finished off Leng. "I have to win something bigger, then I'll get a bigger rail." With just a hair under $1.5 million in cashes and a WSOP bracelet at age 22, it might not be long before that happens. Hand #100: Ryan Leng raised to 175,000 on the button and quickly called all in when Christopher Frank shoved. Leng was pleased to tell his rail he was ahead, but that changed in a hurry, as flopped to give Frank a leading pair of fours. Someone on Leng's rail called for the , but the fell instead. That did bring a few more outs for Leng, as a six would give him the winner. The dealer brought forth the , though, and Frank shouted his approval. Hand #93: Christopher Frank made it 150,000, and Ryan Leng called. Leng check-called 180,000, then 430,000 as the board rolled out . Finally, he folded to a river bet of 1,000,000. Hand #94: Leng called on the button, and Frank made it 240,000 in the big blind. Leng called. The flop came , and Frank bet 200,000. Leng called. On the turn, Frank slowed down with a check, and Leng bet 375,000. Frank called. On the river, Frank checked and tank-folded to a bet of 555,000. Hand #95: Leng got a walk. Hand #96: Leng made it 175,000 on the button, and Frank called. The flop came , and Leng bet 210,000. Frank called. The German then check-called 525,000 on the turn, and the river was the , completing a couple of draws. Frank checked a final time, and Leng bet 1,250,000. Frank thought for about 15 seconds and grimaced before splashing in a call. "You're good," Leng said, flicking into the middle. Frank had turned a pair with and took the pot. Hand #97: Leng got a walk. Hand #98: Leng called on the button, and Frank checked. Frank checked the flop, and Leng bet 65,000. Frank raised to 180,000 and got a quick fold. Hand #99: Frank raised to 125,000 on the button, and Leng folded. Hand #84: Christopher Frank opened, and Ryan Leng called. They checked to the turn of the board, where Frank bet 225,000, and Leng called. The river was the , and a Frank bet of 450,000 got Leng to fold. Hand #85: Leng limped, Frank raised, and Leng called. The flop was , and Frank bet 250,000. Leng called. They checked through the turn, and on the river, Leng bet to win the pot. Hand #86: Frank raised, and Leng called to see a flop. They checked through the the turn and river , where Leng bet 120,000, and Frank raised to 350,000. Leng called and mucked to the of Frank. Hand #87: Leng opened, and they went to the turn of a board, where a bet from Leng won. Hand #88: Frank raised, and Leng folded. Hand #89: Leng opened, they saw a flop of , and Frank check-called a bet of 135,000. They checked through the turn, and on the river, they both checked again. Leng had to win. Hand #90: Frank raised, and Leng folded. Hand #91: Frank got a walk. Hand #92: Leng opened, and and they saw a flop of . Frank checked, and Leng took the pot with a bet. Hand #83: Arkadiy Tsinis moved all in from the button, and Christopher Frank called before Ryan Leng's cards were even in the muck. The flop brought , pairing Frank and leaving Tsinis in need of a king. The gave Frank a straight, though, and the river was the . Hand #79: Arkadiy Tsinis made it 150,000 in the small blind and won the pot. Hand #80: Tsinis raised on the button and folded to a shove from Christopher Frank, defending his big blind aggressively. Hand #81: Frank called the blind and folded to 210,000 from Tsinis. Hand #82: Frank limped from the button, and Ryan Leng checked the big blind. After a couple of checks, the board read . Leng bet 150,000, and Frank called. On the river, Leng bet 360,000, and Frank instantly dropped in chips and flipped over . Leng showed for a weaker flush. "I'm not sure if I'm supposed to raise there or not," Frank said with a laugh. Hand #70: Arkadiy Tsinis raised from the small blind and won the pot. 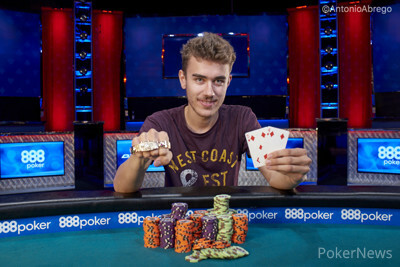 Hand #71: Tsinis raised on the button, and Christopher Frank moved all in to win the pot. Hand #72: Ryan Leng raised from the button, winning the blinds and antes. Hand #73: Frank raised and won the blinds and antes. Hand #74: Leng limped in the small blind, and Frank raised in the big blind to win the pot. Hand #75: Frank limped in the small blind, and Tsinis checked his option in the big. The flop was , and a bet of 60,000 from Frank was called. The turn was the , and it checked through to the river. Frank bet 110,000, and Tsinis raised 250,000 but mucked when Frank called with . Hand #76: Frank made it 130,000 from the button, and Leng called. The flop was . Frank bet 90,000 out of turn, and Leng called. The turn was the , where the confusion was realized, and they checked. The river was the , and Leng check-called another bet of 400,000. He mucked when Frank showed for a flush. Hand #77: Tsinis raised and won the blinds and antes. 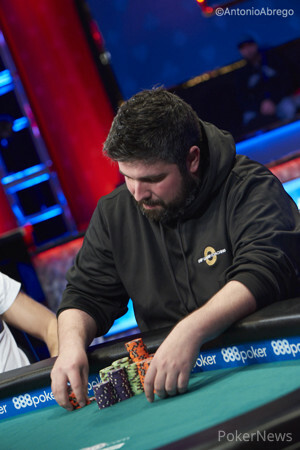 Hand #78: A continuation bet on the flop from Frank won a pot from Tsinis. 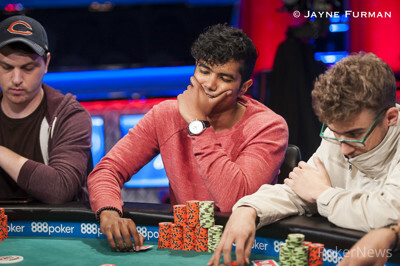 Hand #69: Pratyush Buddiga opened to 125,000 on the button, and Christopher Frank made it 280,000 in the small blind. No sooner had Buddiga announced, "All in," for about 1.7 million than Frank's chips were in the middle and his on its back. Buddiga had and was looking for a sailboat, but the runout did not bring one. Hand #67: Arkadiy Tsinis raised to 130,000 on the button, and Ryan Leng called in the small blind. Leng led out for 115,000 on the flop. Tsinis double-checked his holdings and called. On the turn, Leng check-called a bet of 175,000 from Tsinis. Both players checked as the river made a flush on board, and Leng showed for a flopped one to take the pot. Hand #68: Leng raised to 125,000 on the button, and Frank called in the big blind. On the flop, Leng bet 130,000, and Frank check-raised to 380,000. Leng called, and they both checked the turn and river. Frank rolled over for the nut low, and Leng won with .